Perhaps because it’s going to be an early winter — many trees are already turning, and I’m shedding tears for them — the red squirrels are out in force this weekend, hunting around our neck ‘o the woods in the Shawangunk Mountains in Southern New York state. From my bedroom window today (while half watching Project Runway), I’ve counted three red squirrels racing around the long branches of the hemlocks that surround our home. Their routine: They grab a tiny pinecone (hemlock cones seem custom fit for the diminutive red squirrel), strip it of the seeds, then race back to their den. They’ve been at it hours, looking like frantic commuters scurrying out of the trains at Grand Central, desperate to keep up with the near panic of going, going, going. Of course, I didn’t bring my Nikon this weekend, thinking the dreary weather wouldn’t inspire me to take any photos. Wrong. Always wrong. So far, this is the best shot I’ve gotten, and because it’s so lame, I iPhoned-edited it all to hell to make it look more like a painting. If Acorns Are Poisonous, Why Do Squirrels Eat Them Like I Eat Cupcakes? As it turns out, some acorns — but not all — are poisonous. And a little biological mechanism at work known as adaptation helps our squirrel friends eat most acorns without any problems. 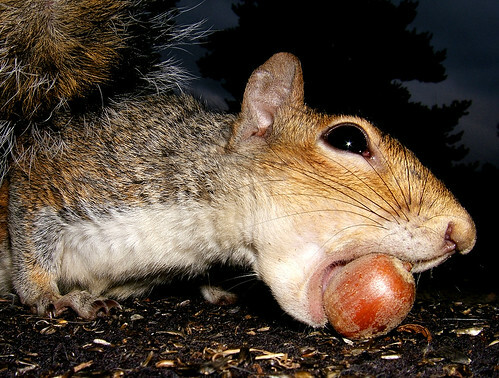 Read Bill’s column to find out what that adaptation is, and which acorns should stay out of your daily recommended allowance. What Do You Feed Your Squirrels? Sadly, there are no squirrels in my neighborhood to feed, but my parents put out corn for their South Texas squirrels. What did they feed them? reeeeeach!, originally uploaded by treeee. 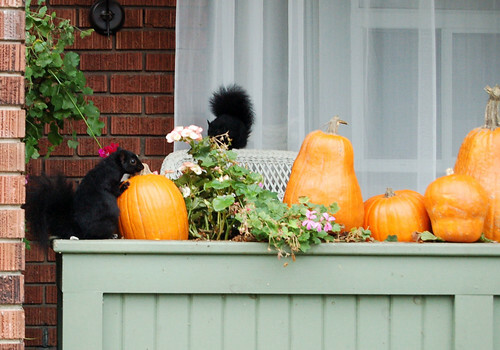 I can’t blame squirrels for tearing apart pumpkins placed outside of homes this time of year. It’s a bit like putting a margarita and fresh-out-of-the-fryer tortilla chips in front of me and expecting me to simply admire the bounty. Besides their tendency to make a holy mess out of the pumpkins, there’s also the problem of squirrels eating fermented pumpkins and getting wasted and making a fool of themself on YouTube! 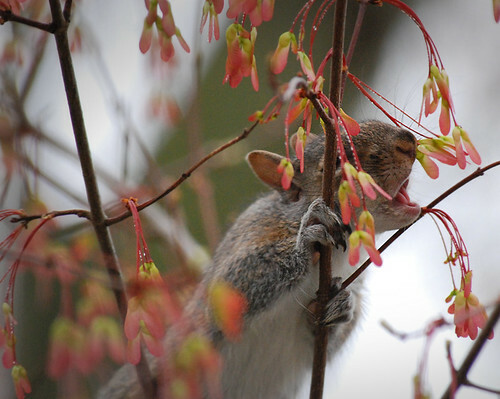 Quick fact: The amount of urban wildlife you see each year is often dependent on how well your trees are doing. Specifically, the more acorns that oaks can produce, the more your squirrels can reproduce, too. Random anecdote: One year I noticed a disturbing amount of dead squirrels lining the roadways in Westchester County, NY. Every few feet there was a dead squirrel, its fluffy little tail still waving in the wind. I was a newspaper reporter, and so I used that as an excuse to do a little investigating and call people who would know what was up. Turns out that the previous year was a very good year for acorn production, which meant there was roughly double the amount of young squirrels. Frenzied to collect food for the coming winter, these juveniles were running about, rashly crossing roadways, ending up as roadkill. As the state biologist told me, it had a way of bringing the squirrel numbers back down to normal, albeit in a particularly gruesome way. I haven’t quite seen the same phenomena since, because I got a job in Manhattan, where squirrels are far more savvy to human dangers, like cars. For more on the connection between acorns and wildlife, read Acorns vital to natural balance.